Romaine Bernard Shackelford, Osage veteran, artist of the Osage Nation’s seal, historian and beloved elder, passed away at his home in Pawhuska on April 1 surrounded by loved ones at the age of 90. A rosary will be held at 7 p.m. on Thursday, April 4, at the Wakon Iron Chapel. A traditional Osage service will be held at 8 a.m. on Friday, April 5, at the Wakon Iron Chapel. A Catholic mass will be held at 10 a.m. at the Immaculate Conception Catholic Church in Pawhuska. Interment will follow at A.J. Powell Cemetery in Hominy, Oklahoma. Dinner will follow at Wakon Iron Hall in Pawhuska. Shackelford was born in San Diego, California, on Oct. 2, 1928, to Manuel Romaine Shackelford and Wauneta Harrison. His grandparents were Ben Harrison and Minnie Harrison. His grandfather Ben, his hero, raised him until the age of 10. He attended Wyandotte Boarding School and later attended Haskell where he was a lineman on its undefeated football team. He subsequently became a proud Haskell alum where he forged many lifelong friendships. He enlisted in the U.S. Army and served in World War II as a medic in Europe for nearly three years. He is a lifetime member of The Veterans of Foreign Wars and was a member of the Harold Bigheart Smalley American Legion Post 198 in Pawhuska. In 1950 he married Ruth Mae Hopper from Hominy and moved to Pawhuska where they started a family and had six children. In 1957 the late George Labadie asked Shackelford to come up with some sketches for a tribal seal, Shackelford said in 2008. The very next day the Osage Tribal Council selected what has been the Osage people’s official seal. Osage Nation flags have been flown throughout the world and shown on many national stages by Osage athletes. Shackelford’s artwork, painting and bronze sculpting, is known throughout Indian Country and has been in art shows and exhibits throughout the Midwest. He is also known for his traditional art of making men’s headdresses worn at Inlonshka and other tribal dances. He worked for Phillips Petroleum Company in Bartlesville for 35 years and retired in 1985. He loved to fish, hunt for arrowheads and referee football. He loved a great laugh, a warm house, a cup of coffee and a hot breakfast. He loved his family most of all. An avid reader and historian at heart, especially when it came to Osages, Shackelford spent many hours visiting with full blood elders. His taped recordings are a significant piece in adding validity and meaning to Osage history, culture, language and the Inlonshka. 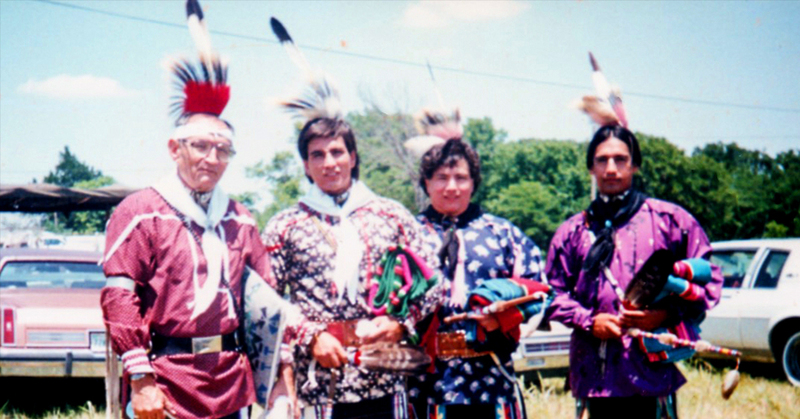 His work is kept safe by the Wahzhazhe Cultural Center and the Osage Nation Museum.